JAYAPURA (Sydney Morning Herald / Pacific Media Watch / West Papua Media Alerts): Indonesian authorities want to jail two French journalists for five years for the “crime” of reporting from West Papua without journalists’ visas. The Sydney Morning Herald reported yesterday that instead of deporting journalists Thomas Dandois, 40, and Valentine Bourrat,29, as is normal practice, Indonesian authorities want the maximum sentence. The head of the Immigration Office in Papua, Garda Tampubolon, told Fairfax Media that the journalists would remain in jail until their trial started, which might be next month. Dandois and Bourrat have already been in custody for a month. “Police spokesman Sulistyo Pudjo said the criminal subversion investigation was under way but ‘this is a very complicated case, it is not easy’. The charge carries a 20-year jail sentence. Police have indicated in the past that Dandois and Bourrat are under suspicion over an ammunition swap gone wrong in the Papua Highlands, during which two police officers were shot. 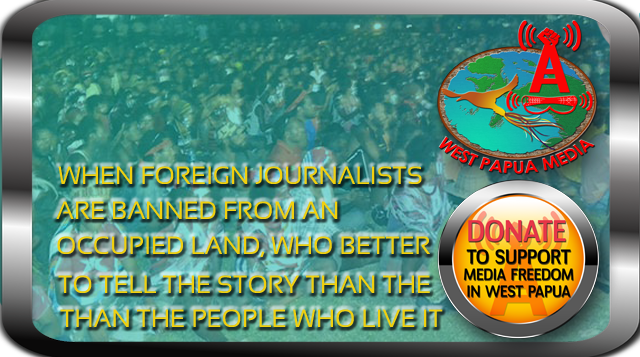 However, the only evidence of their alleged involvement appears to be that they interviewed political separatists”. It appears that Indonesia wishes to deter foreign journalists from reporting on their 50-year military occupation of West Papua because they are persisting with charging Bourrat and Dandois even though the journalists issued an apology for reporting without the correct visa. Arte TV’s production house has also promised not to use any footage which “may discredit Indonesia’s reputation”, the Sydney Morning Herald reported. Meanwhile, the West Papua Media news service reports that several West Papuans have been arrested for meeting with Dandois and Bourrat last month. These are respected indigenous West Papuan leader, Areki Wanimbo, who met with the journalists on the day they were arrested, along with Deni Dow and Jornus Wenda who also attended the meeting. Theo Hesegem and a Mr Logo, who accompanied the journalists to the meeting with Wanimbo, were also arrested. Low, Wenda and Dow were interrogated for 24 hours before being released without charge, but Wanimbo remains in detention and has been charged with “complicity to misuse a permit” and “treason”. The “treason” charge relates to Wanimbo collecting donations for a meeting to discuss West Papua’s membership application to the Melanesia Spearhead Groups (MSG).